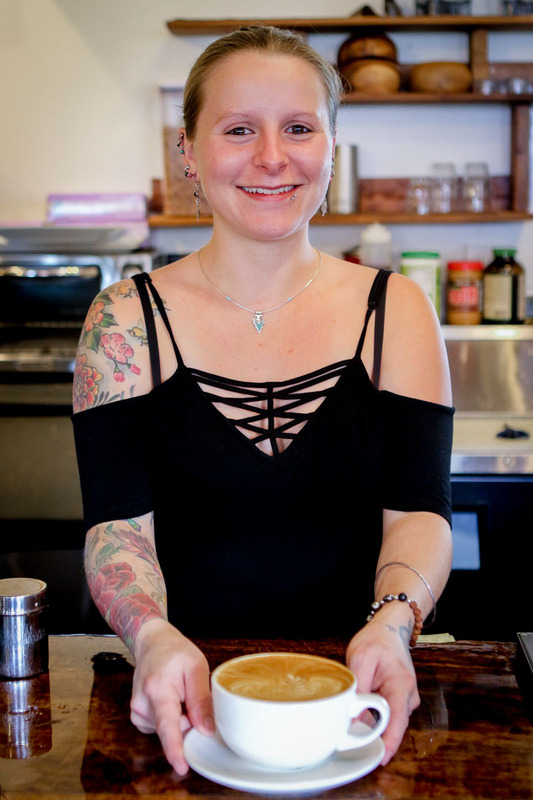 An employee and manager at the Waimea Coffee Company for almost four years, Alicia Greenwell is moving to Colorado in June and the shop blog caught up with her recently for the latest barista profile. Greenwell, 28, also runs her own business called Four Elements Media, specializing in visual communications from photography to logo design. She has accounts with several business and, in fact, edits and publishes this very blog. Born in Wailuku, Maui, Greenwell moved with her family to the Big Island as a 2-year-old. The oldest of three sisters, she attended Honoka’a High and had parents who made sure she stayed busy – camping in the mountains, going on outings to the beach, and playing sports (like soccer and distance running). While in high school, she ran track and cross country and played soccer year-round with club teams. After graduating, she wanted to explore a bit. She landed at the University of Oregon, earning a degree in journalism, with an emphasis in magazine/visual communications. After college, she shifted to Colorado to be close to a sister and ended up living in Denver where she “didn’t know anyone.” That is, until she encountered a woman in her late 80s named Nona. Greenwell first got into the coffee business in Denver, after hanging out a local shop called The French Press. Greenwell’s most recent return to the Big Island occurred in 2014, when she hooked on with the Waimea Coffee Company. Emma Kauhane worked alongside Greenwell at Merriman’s Hawaii Restaurant before she was hired on at the Waimea Coffee Company. Greenwell eventually took on more responsibilities at the shop. Of her impending move to back to Colorado (in June of 2018), Greenwell cites the reasons she will miss both Waimea Coffee Company and her home on the Big Island. For now, the future beckons back on the mainland, where Greenwell and boyfriend Josh Robinson, also a Big Island native and graduate of Honoka’a High, will venture without a certain plan yet. 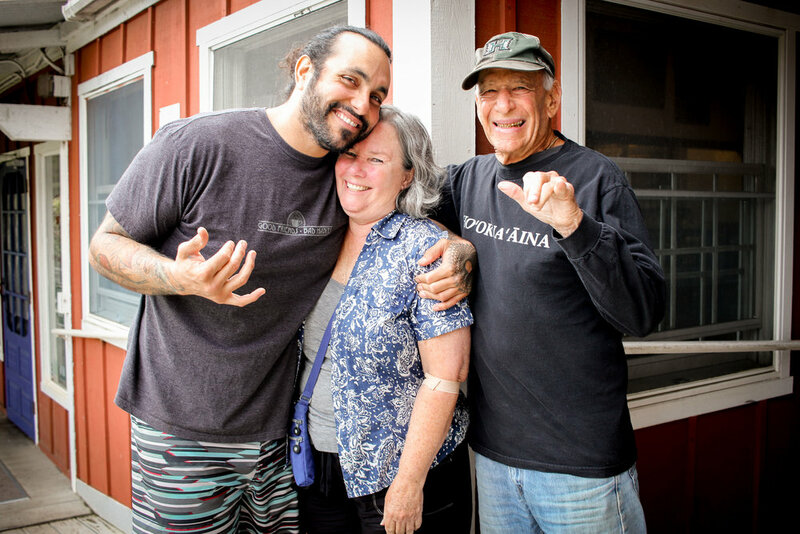 Allen and Sally Wooddell have a morning walking routine that includes a stop at the Waimea Coffee Company, just about a half-mile from their home. In fact, they’ve been regulars at the shop long enough to remember when it was called Waimea Coffee and Company (emphasis on the “and”). The usual order for a couple of regulars? A chai latte for Sally (sometimes) and a café mocha for Allen (always). Married since 1975, Allen (85 years old) and Sally (71) first met in the early 1970s when Sally was hired to work in Allen’s law office in Honolulu (though they began dating later). The couple have six children in all, ranging in age from 60 to 28, with five from previous marriages, and a daughter together, Kuliaikanu’u. Allen was born in Oahu, went to Punahou School in Honolulu, before attending Dartmouth as an undergraduate and Stanford for law school. He was in the Army toward the end of the Korean War, then moved back to Oahu and also worked in Hilo for a time before moving to Waimea with Sally in 1991. Allen was a lawyer for 32 years and now manages a trust. He once belonged to numerous paddle clubs and was an instructor, though he mostly works in the yard these days. Sally was born in St. Louis, though her family moved to Oahu when she was young and she also attended Punahou (though the two didn’t know each other then because of their age difference). She eloped to the mainland with her previous husband and later moved back to Oahu. Retired now, though an active reader, Sally worked at North Hawaii Hospice for 10 years, at a shelter in Honolulu, a probation program, and as a receptionist. The Wooddell’s have Hawaiian familial connections. Allen recalls that his great, great grandfather moved to the islands in 1824 and his grandmother was Hawaiian. Meanwhile, Sally’s grandfather was initially supposed to journey to Alaska but wound up working on an island plantation. Life in Waimea, since the early 1990s, has been good, the couple says, though the town is much different now than when they moved here. Most importantly, they have family nearby thanks to multiple structures on their “compound” that enable children, grandchildren and extended family to stay or visit. If you happen to amble around Waimea early in the morning, give a wave to Allen and Sally on their morning walk to the shop. 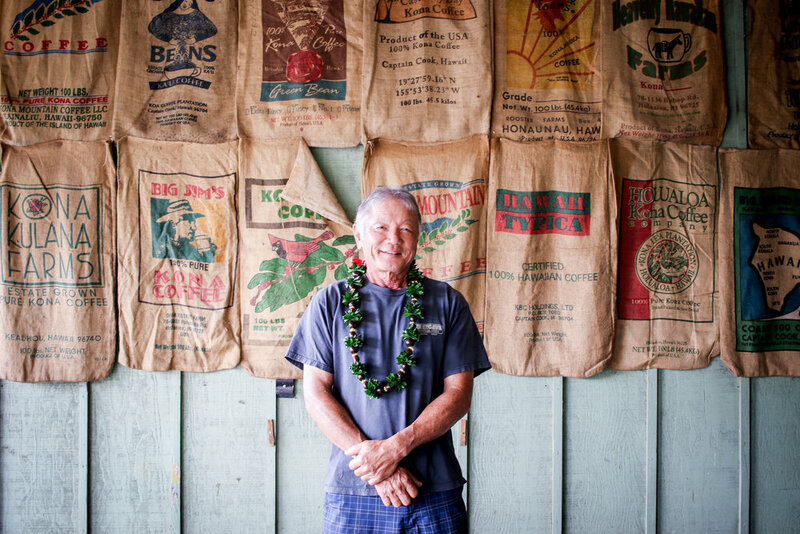 Growing 100% Kona Coffee: "A Labor of Love"
The most amazing part might not be the coffee – which, by many accounts, is some of the best on the Big Island – but that it’s just Eddie Sakamoto. 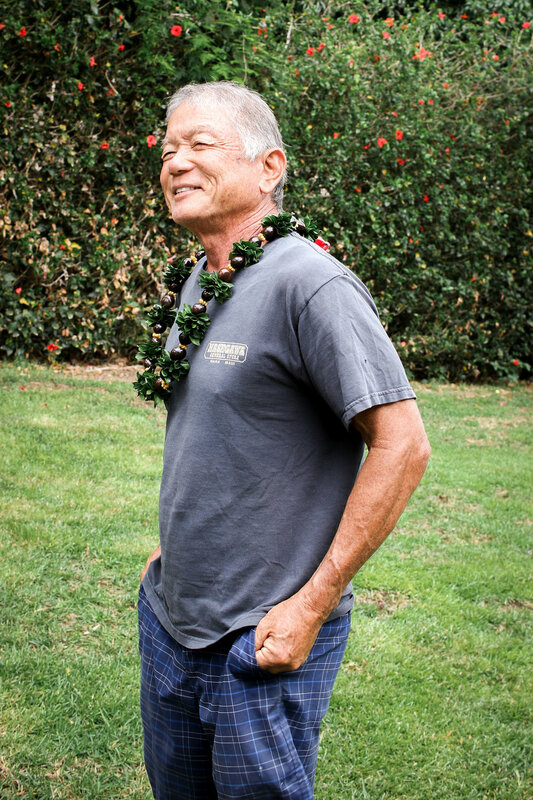 Retired now for five years, Sakamoto, 69, works his half-acre, 250-tree farm beside a comfortable Kona, hillside house almost exclusively by himself. Works it with a coffee basket, hook, and an easygoing disposition. 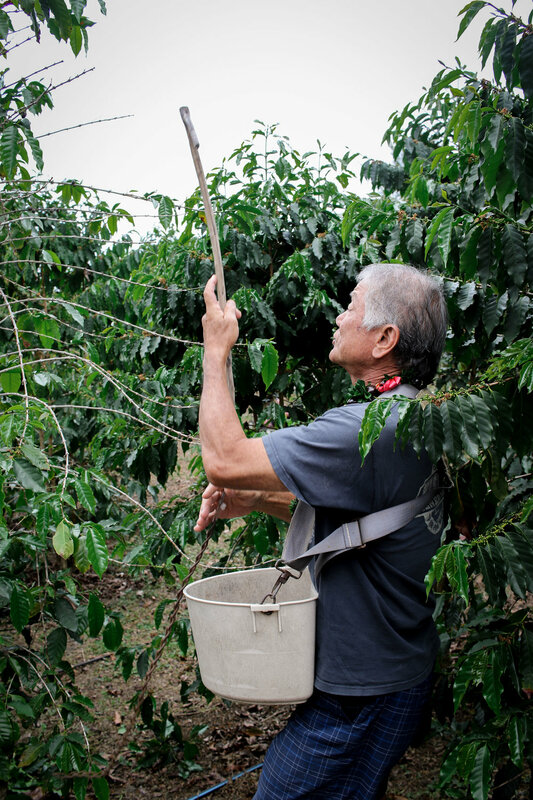 The Waimea Coffee Company is one of very few places to find the Sakamoto label. In fact, just one other store (in Oahu) sells the Sakamoto Peaberry variety that has become a favorite in Waimea. Other outlets for the Sakamoto varieties – there’s the Plantation Pride along with the Peaberry – have included select restaurants or by order from the man himself. A medium to dark roast, the Sakamoto Aged Peaberry is known for complex chocolate, honey and oak flavors and gains it’s “aged” pedigree from beans that are carefully tended and up to 35 years old. 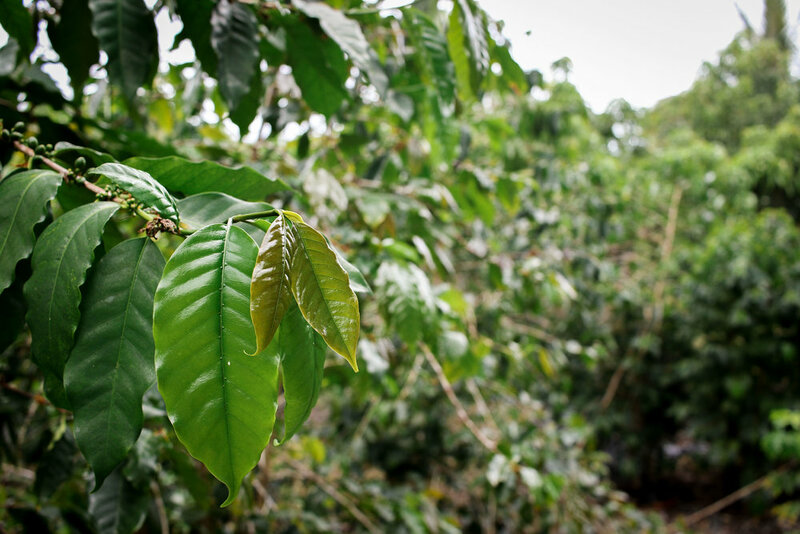 The Sakamoto Plantation Pride is a medium-dark roast that features chocolate, honey and caramel notes. A former waiter and wine steward at the Mauna Lani Hotel for more than three decades, Sakamoto was born in Hilo, moved to Kona in 1979 and is a father of four children. He worked his full-time and part-time jobs together before his recent retirement. The first thing you might notice is her smile: bright, wide, and welcoming from behind the counter at the Waimea Coffee Company. Or her name: Treazure (with a Z). Or, perhaps more recently, the joy that she’s expecting her first child (due date: April 12). Regardless, the shop’s assistant manager manages to provide a consistent burst of happiness. A Big Island native, Treazure O’keefe-Howard was born in Kona as the third of three sisters and grew up on a five-acre farm in Ahualoa that featured horses, cats, rabbits, tons of trees, and lots of grassy fields. The three daughters were home-schooled under “definitely hippie parents, but in a good way,” she says with a smile. Speaking at one of the coffee shop’s outside tables on a warm, sunny Waimea afternoon -- just days before she’s set to begin a three-month maternity leave -- Treazure tears up a bit, somewhat surprisingly to herself, when revealing what working at the shop has meant. Now 23, Treazure has worked at the Waimea Coffee Company for five years. Fondly, she shares why the shop is a special place: the community between the employees and customers, and the numerous connections she’s made and observed over the last half-decade. More recently, the expectant mother laughingly reveals she’s been receiving “so many” pregnancy and parenting tips. 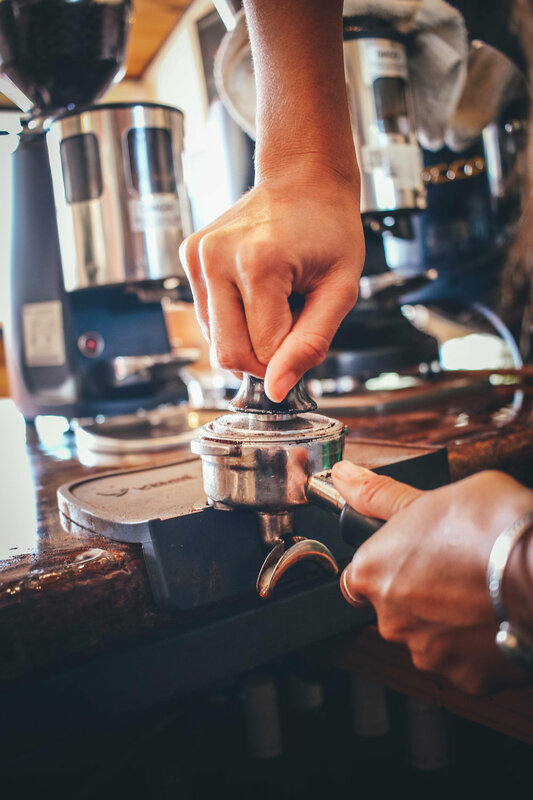 Tennille Lindsey has worked at the Waimea Coffee Company for 18 years and happily describes Treazure as someone who’s always had a strong work ethic and later developed management skills. Mikey first met Treazure when, then as shop manager, he hired her five years ago. He still recalls his first impressions. The personal and professional growth over the last five years that Treazure herself cites is something Mikey notes, as well. Mikey says the duo would often make trips to Kona for shop supplies, but also to buy goofy stuff like little laser guns and, generally, to enjoy each other’s friendship. The cheerful nature Treazure brings to a shift at the coffee shop reveals itself in a very specific way: A laugh that resounds.